So this stew was inspired by a wonderful lentil soup I had last weekend and the bag of beautiful brown French lentils I had in the pantry. I made a HUGE pot of stew, so this is a keep-and-freeze recipe, or cut down the ingredients for a one-off dinner. First: dice the onion and leek really super fine (this is where I become so glad of my Tupperware Happy Chopper, seriously, it’s amazing!) and sautee them off in some oil, in a really big soup or stew pot. When they’re looking translucent, put in about 2 cups of vegetable stock, and all the lentils. Bring the pot to a rolling boil for about thirty seconds, and then down to a simmer and put the lid on. Next: while that’s simmering away, peel and dice the potatoes and carrots into cubes about pea size, and cut the cauliflower into similar sized bits. Before you put these into the pot, wait until the lentils are about 2/3rds cooked. This should take between ten and twenty minutes – depending on the heat of your stove, the amount of lentils etc. 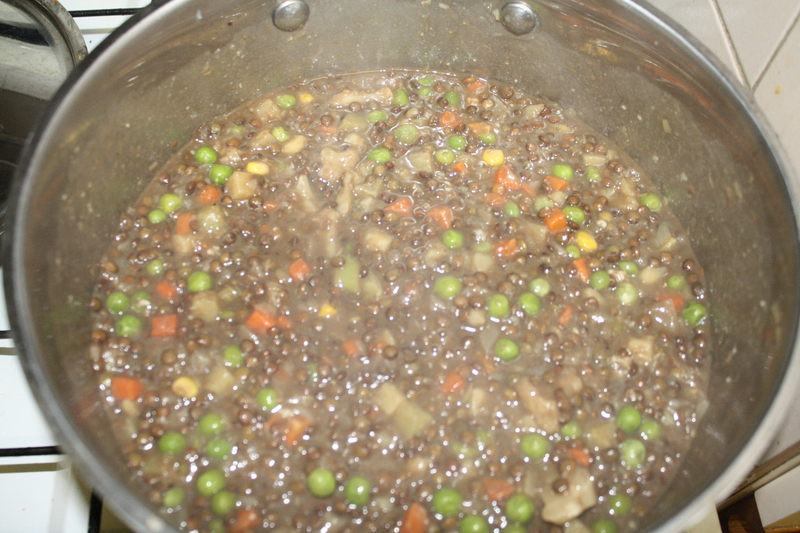 At any stage, if the lentils look like they need more water, add a bit more (or more vege stock). When they’re about there, put the potatoes, carrots, peas, corn, and cauliflower into the pot, along with a tablespoon of gravy powder (or pre made gravy). Put the lid back on and simmer until the potatoes and lentils are cooked. Finally: add a dash of wine, salt and pepper to taste, and if you like your stew thick (like me!) add some flour until desired thickness is reached. Serve up and enjoy a tasty home-made French lentil stew, wrapped in a blanket, with a huge glass of red wine.